So as y'all have probably gathered, I'm slightly behind on my schedule for review books. These three books - Complicit by Stephanie Kuehn, On the Fence by Kasie West, and Fan Art by Sarah Tregay - should have had their own blog posts a while back, but my efforts to catch up include shoving my reviews into one massive round up post. If you're at all interested in any of those books, here are my thoughts. Two years ago, fifteen-year-old Jamie Henry breathed a sigh of relief when a judge sentenced his older sister to juvenile detention for burning down their neighbor’s fancy horse barn. The whole town did. Because Crazy Cate Henry used to be a nice girl. Until she did a lot of bad things. Like drinking. And stealing. And lying. Like playing weird mind games in the woods with other children. Like making sure she always got her way. Or else. But today Cate got out. And now she’s coming back for Jamie. Because more than anything, Cate Henry needs her little brother to know the truth about their past. A truth she’s kept hidden for years. A truth she’s not supposed to tell. Trust nothing and no one as you race toward the explosive conclusion of the gripping psychological thriller Complicit from Stephanie Kuehn, the William C. Morris Award--winning author of Charm & Strange. Stephanie Kuehn is a wordsmith. She may have spoiled all thrillers for me because this was brilliant and there's little chance that anyone can match Kuehn's skill. 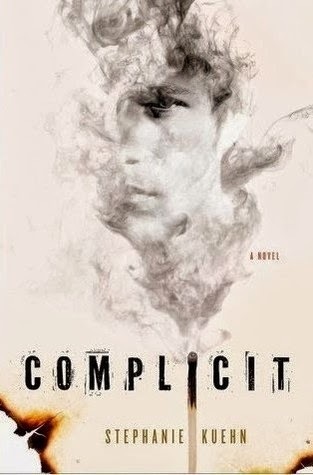 Complicit is one of those sit on the edge of your seat, nail biting thrillers because Kuehn is very precise in her writing: reading this novel, and Charm and Strange, I can feel the effort behind choosing the right words, laying out the scenes to tell a very specific picture, how controlled her exploration of these characters is. The book is short because she's controlled the plotting well and it doesn't need to be any longer to feel anymore effective, and effective it is -- the goosebumps I had towards the end? The way I held my breath? It's really no wonder to me that Kuehn won the Morris award for her debut, Charm and Strange, because not only are her novels well-written, tightly plotted and full of interesting characters, but they also explore serious issues, and that, perhaps, is what I like most about her novels. I read recently in a Maggie Stiefvater blog post that she lets ideas stew for a while before writing because that helps her decide how best to write about them; it's clear from these novels that Kuehn has a lot of ideas, and I think that she's found the best way to write about them too. 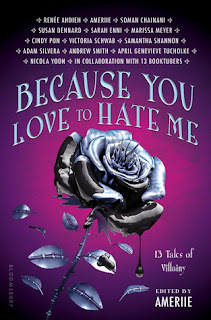 Kuehn is writing about real issues in such magnificent, unusual ways that she defies the labels of "issue book" and "thriller" and so many more, and Kuehn has made me her fan for life. If you could not get into Charm and Strange, I would suggest trying Complicit because although they are written in a similar way, Complicit is much less explicitly sad. They're both mindfucks, sure, and both explore serious issues, but Complicit has an almost eerie, creepy feel alongside the heart break, which, for me at least, seemed depressing (though no less compelling) in Charm and Strange. I can't wait for Delicate Monsters, Stephanie Kuehn's next novel. Another adorable book from Kasie West. The best thing about West contemporaries is that you know you can turn to them for when you want something light and fluffy, something to bring a grin to your face. What I had the most issues with -- and what also drew me the most to this book -- is Charlie's characterization as a tomboy. First off, her family dynamics are adorable. The humor provided by her brothers offset the slight angst of Charlie grieving for her mother, and her dynamic with her father had me outright grinning. With three older brothers myself, and having played basketball and all sorts of sports for a long time, I could relate to a lot of Charlie's experiences. That being said, this also slightly felt like an idealization of being a tomboy; maybe I'm not supposed to translate my experience over hers, but I found it very hard to believe that Charlie hadn't been left out by her brothers and Braden at some point. All the "girl" things she had to figure out hadn't isolated her, nor had their talk on scoring hot girls; this, and a lot of other differences, should have come into play more with her male-centered, testosterone soaked family -- but then again, I think that might have messed with the wonderful vibe and humor in the book. If you were a fan of The Distance Between Us, you'll also really love this book for the cameos by certain characters. If you're a fan of Sarah Dessen, Stephanie Perkins, or Paula Stokes -- or probably Liz Czukas or Emery Lord, whose work I haven't read yet but seems to match here -- you may really enjoy this adorably fluffy novel from Kasie West, sure to have you smiling until the very last page. What I most like about this book is that it reminds me of what Jacqueline Woodson had said in the #WeNeedDiverseBooks talk at BEA: the problem with issue books was that they were being marketed as "issue books." You could call this an issue book because it features a gay protagonist, but it's more than that. It's an adorable romance about facing your worst fears and wondering whether your friendships are strong enough to hold despite the stress, expressing yourself through art and finding safe spaces to explore what you believe in and who you are. 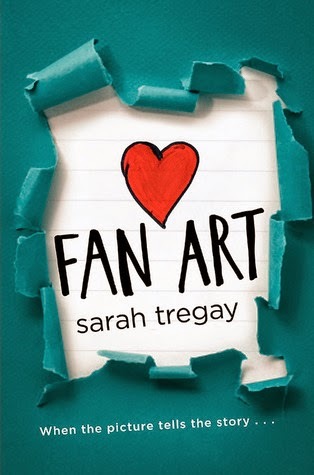 It's as the last paragraph of the summary said: This book is about what happens when a picture reveals what we can’t say, when art is truer than life, and how falling in love is easy, except when it’s not. Fan Art explores the joys and pains of friendship, of pressing boundaries, and how facing our worst fears can sometimes lead us to what we want most. Despite never being in Jamie's situation, I found that it was easy to identify with him, particularly when it came to managing the graphic content of his school's literary magazine, which I also did in school not too long ago. He's not perfect -- he believes in a lot of the stereotypes that are spoon fed to us in the media about what his and others's identities mean (and also there are some stereotypical characters), but that made the book more realistic to me, though if you're sensitive to these things, you may not like the book as much as I did. Jamie's friendship with Mason, his with Eden and practically the whole school, were also a treat to read. I liked seeing how Jamie fit in with his peers, and how even though he was an extrovert, well-liked, he still knew about their prejudices and how coming out would then affect his social standing. It wasn't an idealization of a school, or his situation, which I appreciated from the author; and I appreciated seeing Jamie come to terms with and decide what was most important to him. Excellent character growth and an adorable romance feature prominently in this fresh young adult contemporary debut. Potentially also The Queen of the Tearling, but not in audio format. The Vanishing Season by Jodi Lynn Anderson - I'm probably the only person I know who wasn't CAPS!FLAIL! in love with Tiger Lily, and for that reason I wanted to give Anderson's books another chance. I haven't read much in TVS, but I'm not hooked just yet. Hopefully I'll get more into it soon? Exquisite Captive by Heather Demetrios - I really shouldn't have requested this ARC because having Lebanese parents and growing up in an Arab culture, I am hyper critical of the Middle Eastern cultural hints in novels. I don't think that I'll finish this novel - or if I do, it'll be to fulfill a rant, which is stupidly masochistic, so hopefully I'll just abandon my attempt soon. Have you read any of the above novels? Looking forward to any of the following reviews? Bookish rounds coming back tomorrow, I think! I have almost everything - just need to organize. I thought On the Fence was pretty cute. I did like The Distance Between Us more, because it took me a little bit to warm up to Charlie. She was a bit abrasive to start with. I did love the family dynamics though, too. I don't know, I'm still not sure if I'm into the fluffy stuff enough to try a West book. On the other hand, Complicit sounds amazing! The writing sounds great, plus I love thrillers. :) Thanks for the reviews! Yes!!! Fan Art, despite some of the things Jamie said, was just too adorable not to like. Mason too was a great love interest. I liked the art geeks. I knew quite a few girls like that who totally would've been drawing them together if Jamie and Mason existed at my school ha. And YESSSSSS I thought I had things figured out with Feed, but oh hell no. Mostly with the ending, though. True. But they both seem a bit abrasive, just in different ways. Charlie's mean to that guy whose grandpa died at the beginning, but... oh gosh I'm forgetting her name - the MC in The Distance Between Us was mean about rich people. Maybe we're more forgiving toward the latter? I'm glad you enjoyed both Kasie West books -- here's to hoping we enjoy many more to come! A nail-biting thriller, I do really like that! On the fence was adorable :D You know me and how few contemporaries I read, but this one made me smile. Such cute fluffiness. It really is, Mel. It takes a bit to get into the swing of things, but when it's there, it's creepy and unpredictable. Yeah, Kasie West books are the perfect type to get you to smile :D. Read more of them for the cute fluffiness for sure! Haven't read the others, but FEED! That was quite a "WOW/OMG this can't be happening" book!